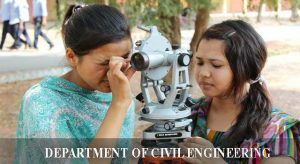 The Department of Civil Engineering, established in the year 2014.The current approved annual intake of the department is 60.The excellent infrastructure is further an added advantage. The department has 9 number of well established laboratories housed spaciously with excellent natural lighting and ventilation. During the practical classes, every student is trained individually to handle and use the equipment in all the laboratories to get complete hands-on experience. The department also conducts workshops, seminars and guest lectures by eminent persons from academic. The department strives hard to impart quality education and to keep the students on the competitive edge of the present-day technology Emphasis on practical education coupled with strong concept oriented teaching-learning process has been the backbone of the department ever since its inception.